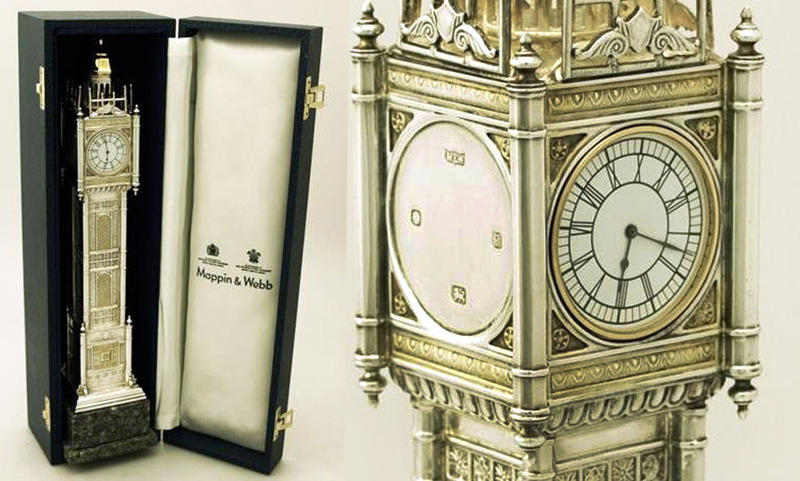 This English cast sterling silver and silver gilt “Little Ben” is a miniature version of London's most famous clock tower 'Big Ben.' This model has been chased and embellished with panels of silver gilt to reproduce the fine architectural detail of this Gothic style clock tower. 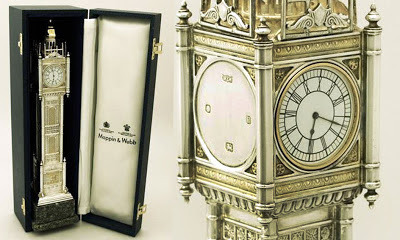 Mappin & Webb made this replica in 1983 at a height of 28.5cm or 11.2 inches. The cupola-style top may be removed, allowing access to the battery operated watch / clock face. The white enamel watch / clock dials display black Roman numeral hour markers encircled by a minute marked chapter ring.